Aging baby boomers with growing health care needs will face a pressing shortage of long-term care beds if steps aren’t taken to nearly double the number of existing beds by 2035, argues this CMA-funded report. Wait times are already high and will increase significantly if changes aren’t made to the delivery of health care for seniors. 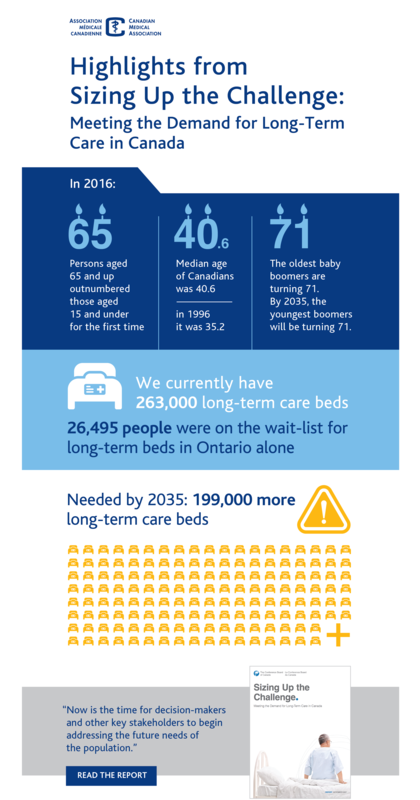 In Ontario alone, nearly 26,500 people were on the wait list for a long-term care bed in 2015, a number equal to about one-third of the total number of long-term care beds in the province. If new long-term care beds are made available, the savings arising from freeing up hospital beds currently occupied by seniors and the associated economic benefits will more than offset the cost of constructing and operating the new long-term care facilities. It will cost an estimated $64 billion to build facilities for the 199,000 additional long-term beds required across Canada and roughly $130 billion to operate them. However, these construction and operating costs would contribute $235 billion to Canada’s GDP, create 123,000 new jobs each year and boost government tax revenues by $71 billion. The new beds could also improve the health of an aging cohort of Canadians requiring long-term care outside their homes. New long-term care capacity is a winning formula providing both economic stimulus and better care for our aging citizens.